Let’s be clear. I live in Canada. It is not tomato season. It is not basil season. Yet, it’s always bread season? Also, I don’t think this is what most expect from a traditional bruschetta, as there’s no fine dice (although you totally could go that route) and there’s some mozzarella in the mix. So, yeah – that’s a lot of disclaimers before I even share one of my all time favourite recipes! 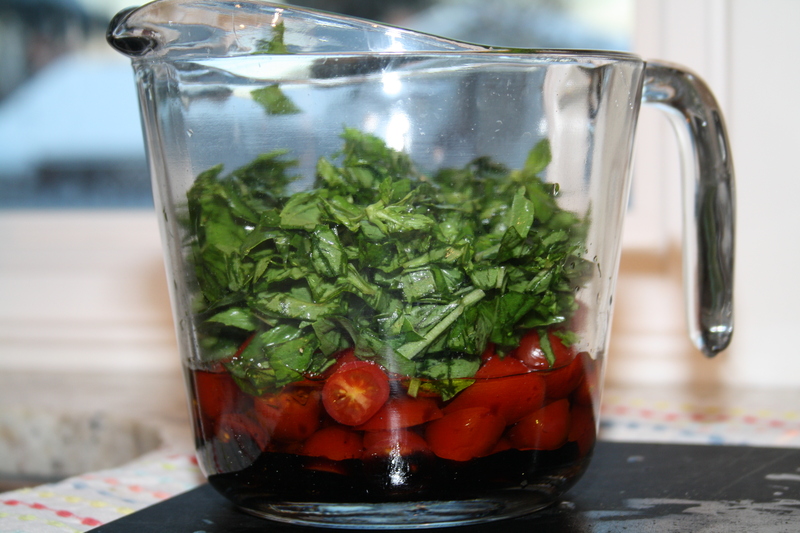 It’s true, when tomatoes and basil are in season, this is probably even more wonderful. But when the squashed basil at the grocery store doesn’t look half bad, I encourage you – buy it! It is so summery and fresh and peppery. This is happy, bright food. My family makes this recipe. I think the original recipe came from a cooking class they did without me – not sure how that happened? – but we’ve all been making and adjusting and loving this recipe for many years. My Dad makes this for Marcus and I a lot. When he makes it, there’s more garlic and he does a chunkier dice. My Dad also dices the tomatoes a little finer than I do. More patience, I suppose. It is so easy to get creative with this recipe. I think the addition of mild, finely chopped onion would be delicious. Some grated parmesan would be good too. If you want more or less basil, go for it. Have something lying around other than french bread? Try it! You will either love or loathe the “approximates” in this recipe. I’m on the love side of the fence, because it’s, frankly, super hard to mess these up. Don’t fret if you don’t have enough basil or tomato. Or you skip the mozzarella. Or whatever. 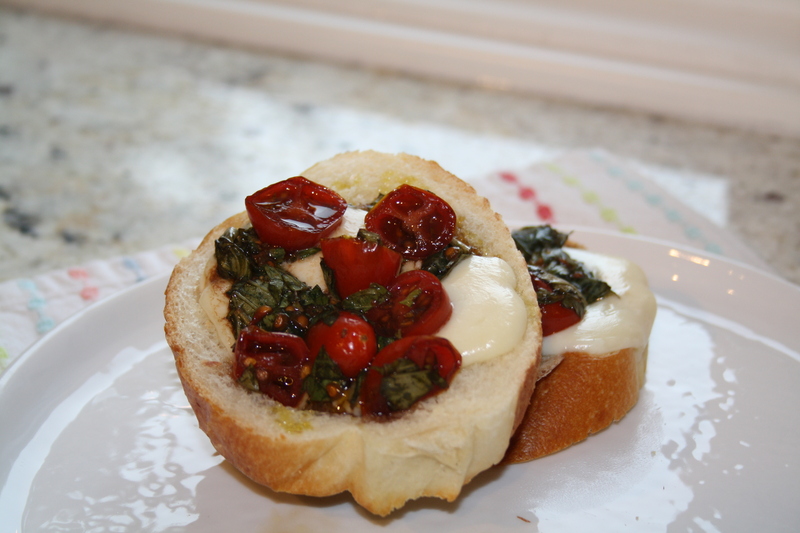 You can add more olive oil, or no salt, or just eat the bruschetta straight out of the bowl. It will be so delicious and so simple. Because this is a breeze to whip up and you can make the bruschetta mix in advanced, these are excellent for entertaining. I make these an embarrassing amount for my guests. Come to my house for dinner? You’re getting these :). My Dad is a bread connoisseur. For real, bread is like another food group. I don’t think it’s a bold statement to say it is easily my Dad’s favourite food. I love how much he loves it, and how much he’s into this recipe in particular! I can’t blame him. 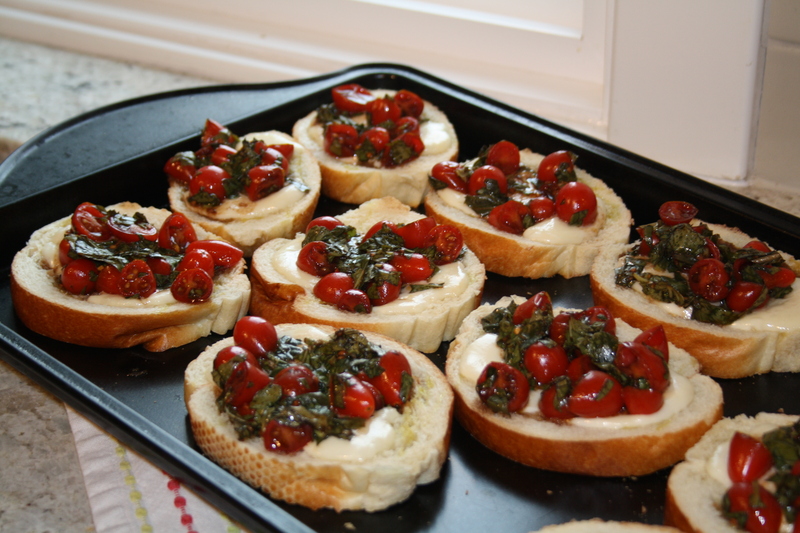 These bruschetta toasts are sweet balanced with acidic. 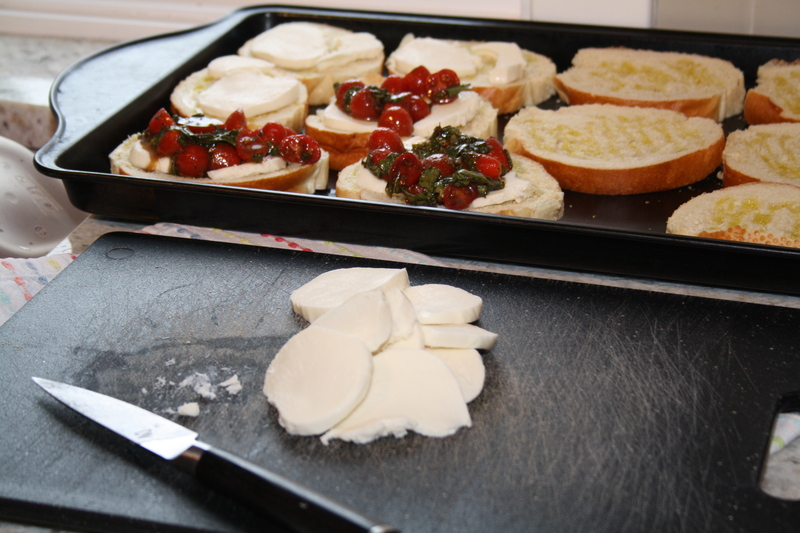 They are creamy from the fresh mozzarella, and crunchy of course from the toast. They are perfect and such a treat. Dad, these are for you! 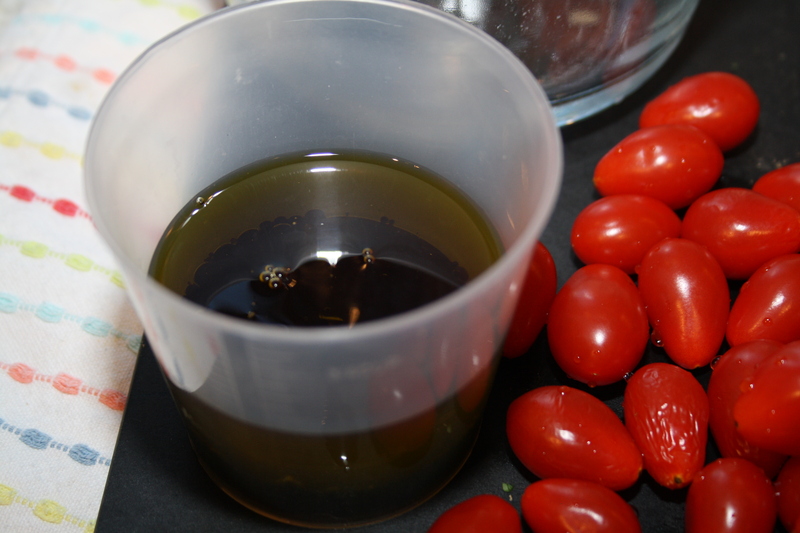 In a bowl, mix together the olive oil, balsamic vinegar, garlic, salt, basil, and tomatoes. Give it a really good stir (and a good taste – yum! ), and let it sit for at least an hour. You can even leave it in the fridge for 1 or 2 days. However long you let it sit, ensure you give it a nice stir when it comes out of the fridge. When you’re ready to prepare the toasts, preheat your oven to 350 degrees. 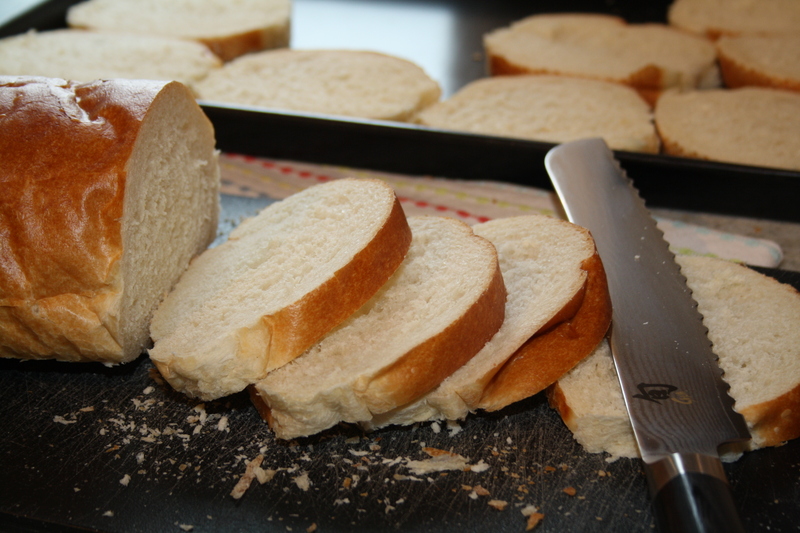 Place bread slices on a baking sheet. 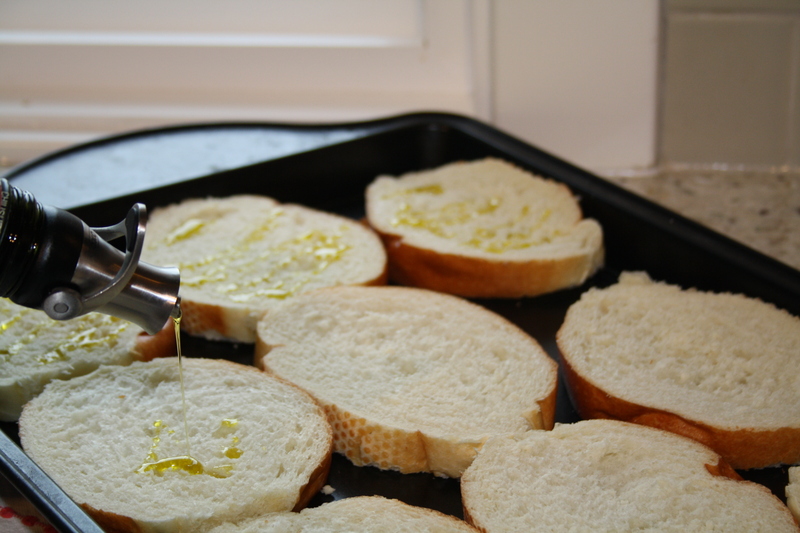 Brush or drizzle olive oil over the bread slices and bake for 5 minutes. Pull the bread slices out of the oven, then place the mozzarella slices on the bread, breaking some up so each piece gets a nice amount. Spoon the tomato-basil mixture on top of the mozzarella, leaving any excess liquid at the bottom of the bowl (to toss or repurpose). Put the bruschetta toasts back in the oven for another 8 minutes, until the cheese gets gooey and the toast becomes golden. Serve hot with soup, anything barbecued, salad, a protein, quiche, Cauliflower Cake, pasta, and everything in between. It’s good cold from the fridge too. hhhhmmm….I have Mikes family coming over this weekend. I will definitely serve this one up. But you make it so much better. Yummy!! I hardly doubt that! And this will be excellent for a family dinner!